Shocking. While writing my book, I encountered many professionals who deal with pain, healing, and cancer and were often stunned and stumped by my questions about 20 and 30-something patients. There was a total disconnect that our bodies could be so fallible. That yes, we can and do end up as their patients too. Not so with Dr. Diane Meier. 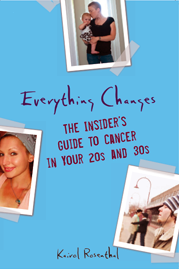 She is a palliative care physician who I connected with and interviewed for my book Everything Changes: The Insider’s Guide To Cancer in Your 20’s and 30’s. I’m excited to share on the page with readers her practical knowledge that debunks the myths of pain relief methods and medications. I was thrilled to learn this week that Dr. Meier became a recipient of a MacArthur Fellow award. Congrats! Check out this clip of video to learn more about her work. Visit the MacArthur Foundation to see videos about other inspirational scientists, artists, anthropologists, musicians, and more who are changing the world. I’m curious, if you could nominate someone as a MacArthur Fellow, who would it be?